One of the things people who have come to our house discover is that, since I turned vegan a few months ago, we have a lot of seeds & nuts (in addition to other grains French people don't eat often like Kasha, Quinoa or Millet) in the house as I use them as a great source of proteins. 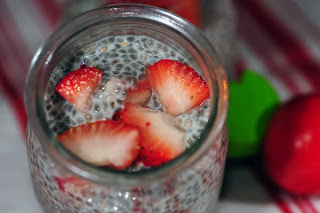 Our children do eat Chia seeds in their yogurt... and have been enjoying some versions of this Chia pudding.... so voila another easy healthy homemade dessert! Bon Appétit! 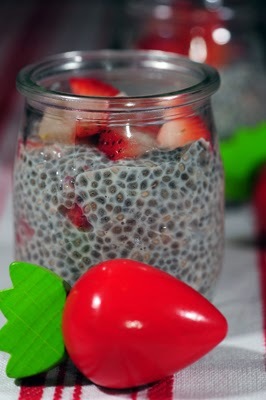 In a large bowl, measure 1/4 cup of Chia Seeds. Slowly add 1 cup of milk, stirring a lot. Stirr more so that all the seeds get wet. Add syrup/honey and sweeten taste. Put in the fridge, stirring it frequently so that no chia seeds cluster together. I have tried it with Soy, Almond and Coconut milk. I prefer it with whole coconut milk. You can play with the ratio chia seeds: liquid. I like it at 1:4 but some people like it at 1:3.